Vending machines typically run 24 hours a day, whether anyone is likely to use the machine or not. By powering down the machine when it is not needed, energy consumption can be significantly reduced. The VendingMiser uses a Passive Infrared Sensor (PIR) to power down a refrigerated vending machine when no one has been within 25 feet of the machine for 15 minutes. Then it monitors the room’s temperature and automatically re-powers the cooling system at one to three-hour intervals, dynamically adjusted based on the ambient temperature to ensure that the product stays cold. To reduce wear and tear on the machine, VendingMiser’s microcontroller will never power down the machine while the compressor is running, eliminating compressor short-cycling. In addition, when the machine is powered up, the cooling cycle is allowed to finish before again powering down. VendingMiser is a simple external plug-and-play product, being able to be installed on the wall with hand tools. 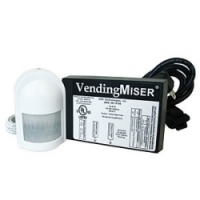 Included with the VendingMiser with Sensor is 1 VendingMiser, 1 Wall Mounting Plate, and 1 PIR Sensor with Mounting Bracket. To control multiple machines (up to four), a VendingMiser may be purchased without the PIR Sensor, but then use its 10 foot repeater cable to allow it to be controlled from the PIR sensor of the primary VendingMiser.